This collection of Hugo games, is absolute tops for kids. More adventures than ever before can now be experienced with the little troll. The successor of Christmas 1998 published Hugo Gold should not be missed in the collection of Hugo games. 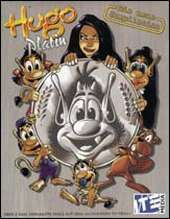 It contains ten of the most popular Hugo games that are already known on television and provides hour after hour for fun and entertainment. Contents: Balloon Ride, Dolmen Cave, Parachute, Rock, Motorcycle, Pile Diving, Sleigh, Snowboard / Apple Harvest, Magic Hands, Rope, Key & Lightning Game.